DALLAS--(BUSINESS WIRE)--For the second year in a row, American consumers have identified rewards that help them save on the everyday cost of fuel as their preferred loyalty program currency. Findings from Excentus' new "Road to Rewards Revisited" annual survey and report also show that certain types of rewards are powerful enough to influence where, when and how frequently consumers shop. Based on a 2016 survey of more than 1,000 U.S. consumers, the second annual report highlights the underlying power of rewards that deliver everyday consumer value and their impact on consumer behaviors. These new findings are particularly crucial for U.S. retailers and merchants as they face multiple challenges, including increased competition for customers but waning consumer activity in existing loyalty programs, according to Brandon Logsdon, President and CEO of Excentus, a provider of industry-leading loyalty marketing and technology solutions for grocers, specialty retailers, convenience retailers and consumer packaged goods companies. Rewards that help consumers save on the cost of gasoline ranked #1 again in 2016 as the most popular loyalty program currency, with 37% of consumers preferring fuel discounts over credit card rewards, coupons, retailer points and instant discounts at the cash register. Respondents say they prefer fuel-saving rewards because they like saving money any way they can (39%) and they like earning rewards from everyday purchases made (23%) among a variety of retailers. The newly published "Road to Rewards Report Revisited" report is available for download here. The report reinforces the influence of Millennials and the mobile environment on loyalty program activities. Nearly 40% of "digital native" Millennials rely on mobile apps to track and redeem their rewards, while across all age groups, the use of plastic membership cards dropped by 4% during 2016, the survey shows. "For merchants and retailers, the findings are clear: loyalty programs that skimp on delivering everyday value are missing critical opportunities to attract new customers and retain existing ones, increase foot traffic, and turn loyal shoppers into higher-value customers," said Logsdon. "Mobile technology has and will continue to make it much easier, faster and cheaper to leverage loyalty programs, particularly for the growing segment of consumers who rely on their mobile devices for life’s daily activities." One of those daily activities is driving, and reported membership in the Fuel Rewards® program, owned and operated by Excentus, grew by more than 9% during 2016 according to the survey. Likewise, consumer interest in saving on gasoline at the pump also rose by 2%, even as average gas prices dropped from $2.79 to $2.25 a gallon nationwide during the survey period. The Excentus-sponsored survey of 1,120 U.S. consumers (+/- 3.1% margin of error) was fielded by Ipsos in the summer of 2016. 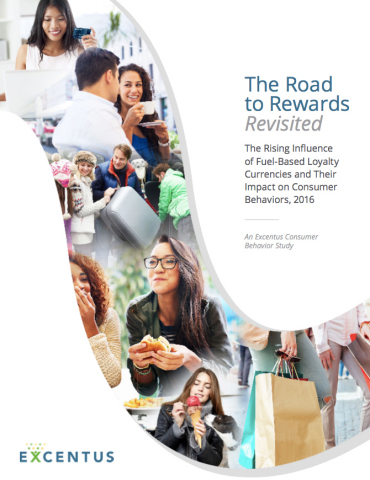 “The Road to Rewards Revisited” is part of an Excentus Consumer Insights Series, available for download here. Further reports in the series will be available in early 2017, focusing on the power and influence of certain reward types, and the impact of mobile on Millennials and the loyalty programs they prefer. For more information about “The Road to Rewards Revisited” report, to find out how other rewards currencies rank, or to interview an executive from Excentus, please contact Vanessa Horwell at vhorwell@thinkinkpr.com or 305-749-5342 ext. 232, or Nikkia Griffin at ngriffin@thinkinkpr.com or 305-749-5342 ext. 239. More information can also be found at http://fuelingloyalty.com/road-to-rewards-revisited.html. Excentus Corporation, a privately held company based in Dallas, provides industry-leading loyalty marketing and technology solutions to grocers, specialty retailers, convenience retailers and consumer packaged goods brands across the nation. Founded in 1996, the company’s robust solutions also support the company’s successful operation and growth of the nationwide Fuel Rewards® program. With its mission of easily lowering the cost of everyday life, Excentus and its customers have helped U.S. consumers save more than $2 billion to date. Learn more at www.excentus.com.